Send your questions and answers or comments to Paramontante@HGAusa.com Perhaps you have an improved answer. See also: Laboratori d'envol. Q1 Safety during pre-certification development of an experimental paramontante? Q4 What will be the response to the stall, surge-pitch-forward situation? Q1 Safety during pre-certification development of an experimental paramontante or parahang? A1forQ1: Free flight implies risks, some known and some unknown. At every step, pause to appraise the full spectrum of risks. Manage the risks methodically. Use team oversight and the buddy system. Obtain formation from experts. Know the physics involved in an experiment. Well test large scale models before human free-flight testing. The construction and test of uncertified experimental wings requires deep knowledge of what is being made. Spanish Expanded English translation and interpretation. Improved expressions are invited. Alternative comments are invited. - Salidas de térmicas fuertes? Cualquier térmica fuerte puede dar problemas. Imagino un abatimiento muy fuerte. - Out of strong thermals? A strong thermal can provide problems. I imagine a very strong depression. (aunque lo parezca). Certification from DHV will be an action item after further development and testing. Paramontante is not yet ready for production. Note2: May 31, 2009: Pere Casellas: Yes, the "manubrio" is an inverted bicycle handlebar that is used in Paramontante II. The initial idea was to use a simple inverted T as in Paramontante I, but Juan then convinced me that it was more appropriate to use a "manubrio de bicicleta playera" with the aim of further reducing the total length of the mast. The result is smart and plays its role very well! This handlebar takes the appearance of an inverted "Y", and we think that could be continued in a natural way, in a triangle of control system..
- Peso adicional >>> unos 3 ó 4 kg Paramontante has parts over paraglider, but those parts will allow fewer and shorter lines and some less wing area. As the flexible bones and mast have functions distinct from heavily-boned gliders, the Paramontante at-wing upper T parts, the mast, and Casellas triangle may be low-massed. An estimate now stands that 3 or 4 kg will be the class cost level over what might appear to be a paraglider in first blush. .
- Manejo de la estructura en el suelo. >>> requiere un aprendizaje especial paramontante - Management of the structure on the ground requires a special learning for hang gliders in the anticipated paramontante class. - Lanzamiento de paracaídas de emergencia sin que entorpezca la estructura .- Launch of emergency parachutes that hinders the structure. The dynamics of an opened emergency parachute while still coupled with the Paramontante will be explored carefully. The common dictum of staying with one's hang glider while being arrested under an emergency parachute will be carefully examined for paramontante gliders. Emergency procedures will be special to the new class. Continuum of boning using advanced airbeam? Material options for the mast? How flexible might the mast be? 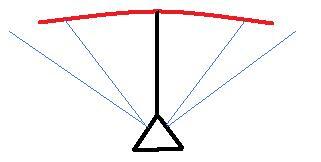 Could the mast be pre-arched slightly so that bump compressions would result in an immediate "give" rather than having to suffer the potential of a compression of a straight beam? How flexible might the mast be while keeping desired flight and control dynamics? Distinguish the 1908c cable-stayed hang glider triangle-control frame (TCF) or hang glider "A"-frame (that repeatedly was employed in all decades of the 1900s) from the 2009 Pere Casellas TCS. In TCS, notice the ______________________________, etc. Far ahead: power-assisted paraHang? Electric ParaHang? E-PH? ParaHang with solar-energy collection-conversion surfaces? Mast and TCS materials as double-purposed ultracapacitors? Hops across nations? Transformer to bicycle paraHang? Transformer: EnergyKiteSystem ParaHang? Sleep-under tent paraHang? Working shade? High UV-tolerant materials? Inspection list for a paraHang? Keeping a distinction between paragliding and paraHanging to bolster safety and avoid rash assumptive actions. Keeping clear how Paramontante is quite distinct from Woopy-like hang gliders. Interface of Parmontante's wing materials and the T top parts. How to support the project? Contributing funds, materials, analysis, ideas, discussion effort, ... Juan has a receptive bank account listed on his site.